Two images from Three: Memories (left) and Going Home (right). The Skinny: A true PanAsian film, this horror anthology boasts terrific production values and atmosphere to spare. While the stories range in quality, the overall effect is one of artful, intelligent horror. Horror goes PanAsian with Three, a multi-region horror anthology from some of the top talents in Asia. The film features three (duh) stories which are presented in distinctly different ways. And while the quality of the three parts varies, the result is still artful, intelligent horror which should appeal to most fans of the current Asian horror wave. Director Kim Jee-Woon (The Foul King, The Quiet Family) leads things off with Memories, a spare chiller about a husband (Jung Bo-Seog) who's having visions of his wife's possible demise. Meanwhile, said wife (Kim Hye-Soo) wakes up in a deserted street with apparently no memory of who she is or how she ended up there. She proceeds to follow whatever clues she can to find her way home, while her husband's visions begin to get darker and darker. 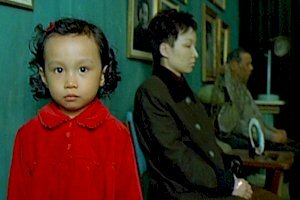 Kim tells his story with in a spare, quiet manner, and relies on meticulous cinematography and stark composition to unnerve his audience. The atmosphere is not unlike most Japanese horror, and the story is certainly chilling. What's interesting here is that the story serves no real purpose for the characters. Everything about Memories is designed for audience (mis)information, and Kim takes his time getting there. But the payoff - no matter how expected or even prosiac it may be - feels genuinely haunting. Story two is The Wheel, from director Nonzee Nimbutr (Nang Nak, Jan Dara). It tells the story of cursed puppets, which belong to renowned Thai pupeteers called Hun Lakom Lek. Their life is an envied and prosperous one, and so their puppets are said to be cursed such that anyone who covets them will meet a terrible fate. This is especially true for Khon performers, masked street performers who perform much of the same tales, but live in poverty. When an old trunk of the prized puppets falls into the hands of a Khon performer Kru Tong (Pongsanart Vinsin), he plans to use them to enhance his life. However, the curse is in full effect and everybody pays, to put it mildly. Greed and jealousy doom those who come in contact with the puppets, and the ultimate journey is one of sinking doom. Nimbutr loads his film with rich cultural detail and sweaty cinematography, but The Wheel provides little more than a front-row seat to watch Nimbutr's various unlikable characters do themselves in. The knowledge that everything will go to hell seems obvious from minute one, and without characters to like, their losses come off as abject lessons and nothing more. The Wheel is certainly interesting, but it's also the weakest of Three's stories. On the other hand, Peter Chan's Going Home provides character in spades, and features some fine acting from Hong Kong Cinema regulars. Eric Tsang is policeman Wai, who moves into a rundown apartment with son Cheung (Li Ting-Fung). Cheung soon goes missing, however, and Wai suspects neighbor Yu Fai (Leon Lai). No wonder; Yu Fai is a dour mainlander who keeps to himself because his wife is supposedly paralyzed. However, when Wai breaks into Yu Fai's apartment, he discovers that her diagnosis is slightly incorrect. And more, he becomes Yu Fai's temporary - and unwilling - guest. Having Going Home anchor Three was a smart move, as it's easily the most emotionally compelling of the three films. The film contains actual characters that test audience sympathy; Yu Fai may be the designated bad guy, but he becomes a much more sympathetic - and likable - character than "good guy" Wai. The revelations behind Going Home are weighed down by too much exposition, but Chan's efficient direction and Christopher Doyle's exquisite cinematography (Is there a cinematographer who can use color better than Christopher Doyle?) make everything easier to swallow. Going Home ranks as the best of the three films as it actually manages to tell a story, and doesn't just explore a chosen theme or narrative style. images courtesy of Panorama Distributions Co., Ltd.